Just outside of Ithaca, in the Town of Enfield, a historic event took place this week that will forever change the energy landscape. Renovus Solar’s “Solar Farm 1”, the first of it’s kind in New York State is up and running, generating clean electricity for two dozen households in the greater Tompkins County area. Solar Farm 1 is comprised of individually owned systems, the power they produce offsets their owner’s usage, often completely eliminating their electricity bill. Solar Farm system owners have essentially purchased their next 30+ years of electricity for a single upfront price and will begin to see return on their investment immediately. Most solar systems pay for themselves in savings within a decade, if not sooner. Going solar is no longer just an environmentally responsible choice – it’s extremely financially compelling, due to the significant drop in the base price of panels combined with the strong rebates and tax incentives available. The revolutionary new Solar Farm model makes switching to solar more accessible than ever before. Until now, solar has been limited to property-owners of viable solar sites, effectively locking out 80% of the population. The Solar Farm houses individually owned solar systems, built together at a remote site, each metered and attached to their owner’s electricity bill. So whether you own your home or business, or rent property, you can own a solar system that generates all the power you need. Solar Farms are possible, and cost effective, because of New York’s Net Metering and Remote Net Metering laws. Net Metering allows renewable energy systems to be connected to the utility grid and the electricity a solar system produces is credited to its owner’s account. These credits offset any power usage the owner purchases from the utility when the sun is not shining. At the end of a billing cycle, the credits generated by the solar system are reconciled with power supplied by the utility. Any surplus is carried forward. Because energy usage is annualized, net metering is a big part of the reason that going solar is lucrative in New York State. Solar systems generate a surplus of credits on long sunny summer days, stockpiling them so that they can offset their owner’s utility supplied usage on darker winter days. Solar systems easily offset 100% of an owner’s annual usage. The Remote Net Metering law allows a solar system owner to build up credits from solar generated energy, as long as the system is tied to the utility grid. So, no matter where the system lives, the arrangement is simply a function of paperwork, reconciling the solar powered credit surplus against the electricity used from the grid. A solar system can be located on a home or business owner’s roof, elsewhere on their property, or on a Solar Farm. On paper, its all the same. These laws also enable a single solar system to offset an owner’s meters at multiple locations. 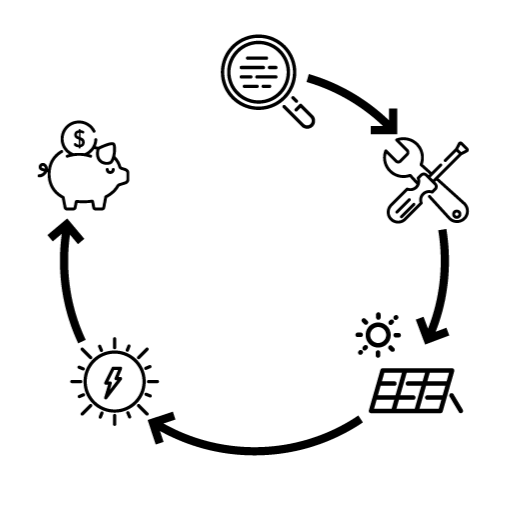 For consumers this means: if a business has multiple locations, landlord has multiple rental properties, a farmer has a residence and a commercial meter at their property, or any other scenario where someone has multiple energy meters, they can purchase a single solar system at the Solar Farm to meet all of their electricity needs. New York State is establishing itself as a leader in clean energy policy. The Governor’s new Clean Energy Standard mandates that 50% of New York’s energy come from renewable sources by 2030 plus a 40% reduction in green house gas emissions. We are proud to lead the region in a massive power shift as we innovate new ways for people to access clean, renewable power . Our “Solar Farm 2” is fully sold, with construction planned to begin within the month. “Solar Farm 3” still has spots available. Interested? Fill out this web form to get a free quote, or give us a call (607) 277-1777. The future for solar has never been brighter.